So, dear reader, I’ve published my very first work of fiction and the truth of the Orwell quote above has hit me hard. Writing the story is only the first step; I’m busy with guest posts, building up reviews, and wooing local newspapers to bestow a couple of columns on my book. It’s a bit like having children; having brought my first book baby into the world, I now have to contend with gestating and giving birth to another one while the firstborn is still a very demanding toddler! On the plus side, I have renewed vigour for my current work in progress; I suspect this is because, after endless rereads and edits and Kindle uploads and proofing, I’m thoroughly sick of The Battle of Watling Street! 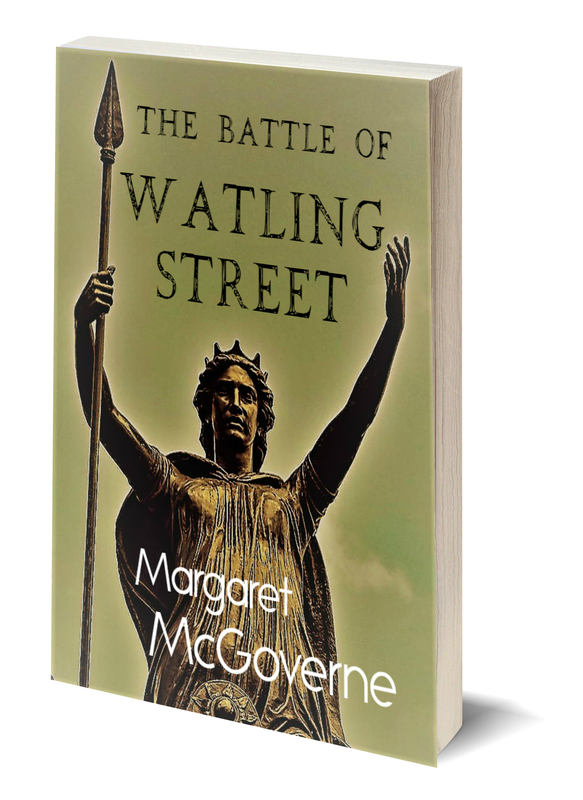 I hope to finish the first draft by the autumn; I’m excited by this one, it’s my first full length novel, and I feel I learned lots from The Battle of Watling Street, even though it’s a less than 20K words novella. At 3.30am this morning, while putting the finishing touches to the edited and expanded second draft of my first completed work of fiction, my laptop froze, and I lost 5,000 words of creative frenzy. Half an hour of despair followed until, predictably, a youngster rescued me and found the Backup files for the Kingsoft WPS programme; my wonderful son. So after running the draft through every grammar and spelling checker known to man, as well as the Google docs consistency checker, I’m ready to release my 17K words historical fiction/Sci-Fi novella to the kind people who have offered to beta-read for me. I’m so excited! And so proud of myself. As usual, I went into the project seriously underestimating the amount of research required; boy, this one was heavy going. The story is set in 1st century AD occupied Britain, and there was LOTS of fact checking, not helped by the cheeky Sci-Fi twist ending. So this post is just to tell you all, constant readers, what a great feeling it is to have finished a 17k words work of fiction, and to ask for your help; if anyone is interested in swelling the ranks of my beta readers and reading a pre-publication copy of the story in return for some feedback, please do get in touch! My day job has just got a lot busier; I’m involved in business readiness for a large transformation IT project at work for the next few months. So what do I do? I create a new writing website! My timing seems atrocious, but I think under the surface I am becoming more confident in my writing and am enjoying immersing myself in all aspects of improving as a writer. I noticed a small apparent gap in the market for sites that accept and publish short/flash fiction between 300 and 500 words. I’ve written a few stories of this length (you can read one at the new site), but some of the websites I found were sadly defunct, or not accepting new submissions. So, I’m proud to present my new short fiction site: strippedlit500.com. I chose the name for two reasons; it seems interesting and catchy (to me anyway! ), and the name embodies what the site is about: short stories, up to 500 words in length, so stripped down, but literature all the same. Most genres are welcome (see the submission guidelines for more info); I hope in this small way to provide another outlet for writers of short fiction. I’ve been busy setting up the site and Twitter, and am proud to present the fruits of my labour. ; now all we need are some short story submissions! So go ahead; put on your writing caps and write a story, ideally between 300-500 words; the theme for the first edition of the site (which will be published as a PDF file and hopefully as an ebook anthology eventually) is…New Beginnings! I’d love your feedback about the idea and the site, or any suggestions to make it better? This is just a quick post to proudly announce that one of my 100-word stories has been published by John Xero at 101fiction.com. Please check the site out, now in its sixth year online, it has some fantastic flash fiction. My story’s title is “Wireless” and it is published in the March 2016 issue. The theme of this issue is “air”.